Purchased from Adelaide Bridal Centre & Spurling Formalwear (Payneham Rd, Adelaide, SA) for my Wedding Day 17/10/10. Paid $2800 (receipt available). Has been professionally drycleaned & boxed to preserve, dress appears like new! 'Moonlight' wedding dress design, purchased by retailer from American bridal fair. To fit Australian size 8. Measurements: Bust - 35, Waist - 28, H - 38. Adjustable criss cross tie up backing with ribbon ends flowing to the floor along with the train (per pictures). Train can be bustled up for reception, dancing etc. Built-in bra cups. 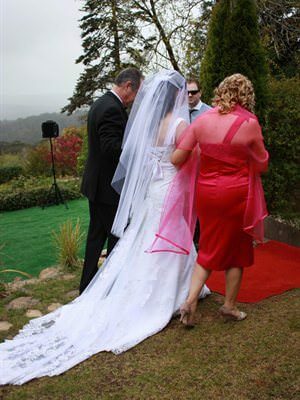 Veil worn with the dress available at request. Lace with crystals & ribbon feminine design (per pictures).